Since its arrival at Jupiter on 5 July 2016, NASA’s Juno spacecraft has completed 16 close flybys—called perijoves—of the gas giant. 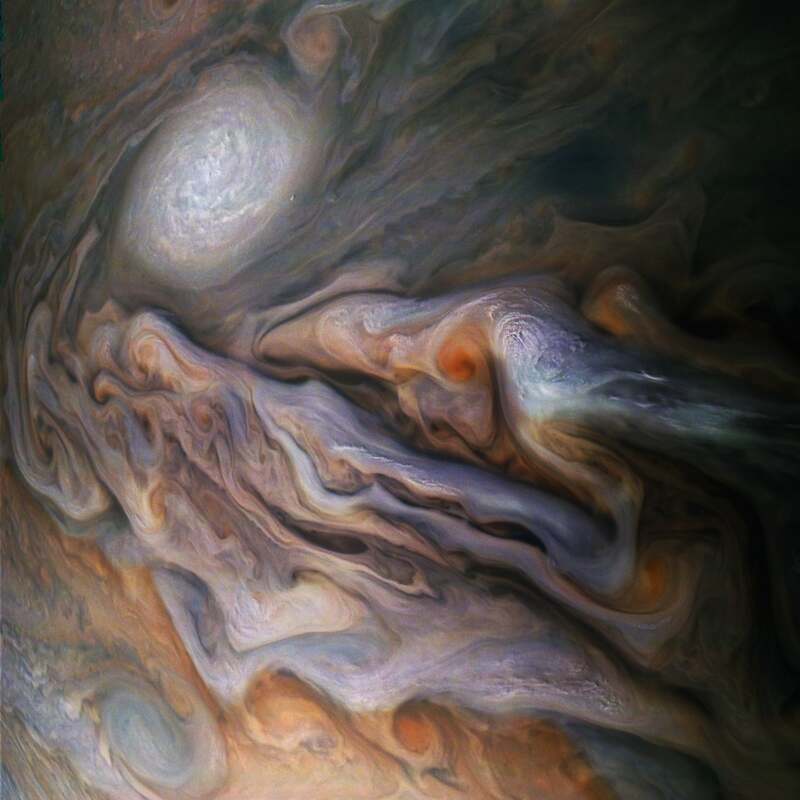 With each successive perijove, the spacecraft inches ever closer to the planet, allowing the probe to take increasingly crisper photos with its high-res JunoCam. The latest image, taken on 29 October when Juno was just 4,400 miles (7,000 kilometres) from Jupiter’s cloud tops, is one of the best yet. This colour-enhanced photo shows Jupiter’s North Temperate belt, a prominent reddish-orange band that’s located at a latitude around 40 degrees north. A large anticyclonic storm, known as a white oval, features prominently in the photo, along with several small white pop-up clouds. The dark regions are where the clouds extend deeper toward the planet’s interior; Juno’s JIRAM experiment, which uses infrared, suggests these darker regions are hotter, according to NASA. Juno captured this photo, but citizen scientists Gerald Eichstädt and Seán Doran are credited with processing the image. Raw photos taken by Juno are available to the general public.